I was planning one of my trips to England, and my friend and fellow speaker coach Peter Botting asked whether there was anything I wanted to see when I visited him in Sussex. "Monk's House," I said, since this home of Virginia Woolf would get me a step closer to one of my writing icons. But a search on the web indicated it would be closed just before my arrival. So I put it out of my mind. But the Friday afternoon I arrived, Peter had a surprise for me: We visited Charleston, the nearby home of Woolf's sister, Vanessa Bell, and Duncan Grant. 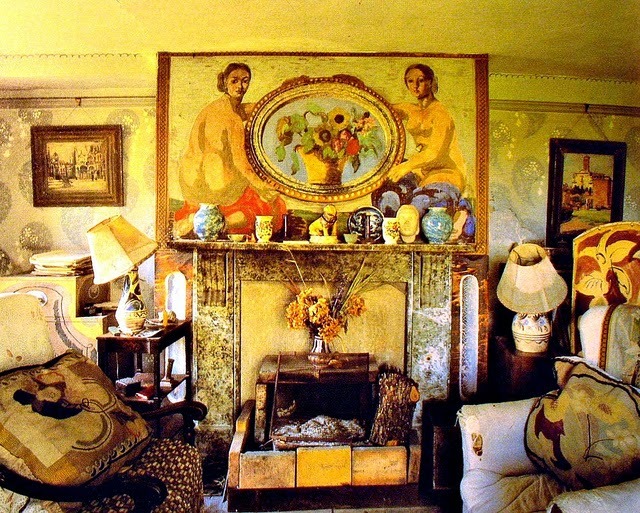 As such, it was a countryside haunt for the Bloomsbury group and Bell and Grant's longtime home and studio. This late on a Friday, we had the place to ourselves, in effect a private tour with a docent eager to share the house's secrets. We started in the kitchen, only open on Fridays, sitting at the wooden kitchen table, well-worn by many hands--the kind of kitchen table where, as Brené Brown says, "everything amazing has happened in my life and everything hard has happened in my life, too." In what Peter calls "the best bit of stage setting ever," we sat around the table with the docent, looking at photos of the family and learning that this was where all of them--including Virginia--had sat. It was at once real, historic, and immediate. We throw around the word "engagement" these days, but here, we were a part of the life of the house, past and present. A long time ago, in a workplace retreat exercise, I was reminded that creativity is the thing I value most in my work. Here, it was on every surface, since Bell and Grant decorated screens, walls, mantels, doors, cupboards and more. The kitchen wall was hung with dozens of colorful ceramic tea mugs made by Bell's son Quentin--later to be Woolf's great biographer--when he was going through an artistic phase of his own. Behind the big cookstove was a tile Quentin decorated in tribute to Grace Higgens, the family's longtime cook and housekeeper, whom he called the "angel of Charleston." We went from room to room in the fading light of this late October afternoon, unable to touch surfaces or take pictures, but soaking it all in. Grant and Bell would paint and repaint surfaces, destroying their earlier work to create anew, and the house blooms with color and verve. Paintings and sculptures of luminaries I knew well from Woolf's diaries and letters were displayed throughout the house, keeping friends and family ever in view. We climbed through the house, from rooms for entertaining to studies and bedrooms, ending our tour in what was called the Garden Room (shown above) for its view of same, but which we dubbed "the cosy room," with its lamps lit against the darkening sky and chairs pressed close to the hearth with its colorful mantel. Then the airy studio, the largest room in the house. Here, in their workplace of decades, were their squeezed tubes of paint and dried brushes, the cigarette butts still filling the grate of the woodstove that heated the room. We exited for a walk through the fading garden, a tangle in its late-year stage, but with paths and beds clearly carved out, and a bench looking back at the house. These were no dabblers, but some of England's great modern artists. Charleston reflects the high value they set upon creativity in life and work. Although it was an abandoned building when they moved there, the creativity applied to walls and tables and cabinets made the house a home, a lively, warm, and liveable one. The temptation to curl up on a chair was strong. I think that's why we left shaking our heads in wonder. This was no stuffy estate, preserved at arm's length, but a house you could imagine living in, with the colorful reflection of its owners all around you. Charleston, with limits for most visitors on lighting and photography within the house, has gotten creative in its communications and social media: The Charleston Attic blog shares artifacts and finds not on display, and Charleston makes good use of Flickr and of Twitter to share views of the house, garden, and events. I've linked to several of them in this post. Last month, a world away in New York City, my trip to Charleston came full circle. At the New York Historical Society, in an exhibit of Annie Leibovitz photographs, I discovered that Charleston and Monk's House are among the images, all taken because the people behind these places inspired Leibovitz. Known for her portraits, Leibovitz chose objects and places without people. She captured the dark interiors of Charleston in this show, called Pilgrimage. I am glad Peter chose this pilgrimage for me so I could see them for myself! Achieving real, historic, and immediate are tall orders all at once. But I came away inspired and refreshed, reminded of the importance of putting yourself in the path of creativity--even when that means creating the path yourself.